Express yourself! Learn about the power of punctuation with these grammar exercises. 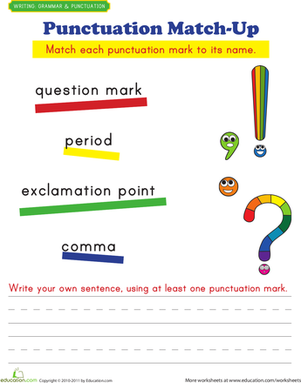 Help your first grader get a handle on punctuation marks with this fun and colorful match-up. 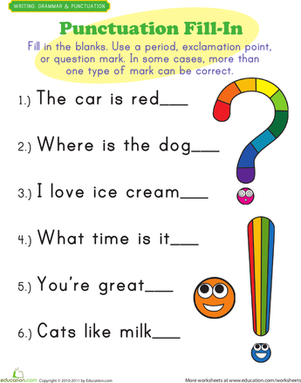 Help your first grader get a handle on punctuation with this colorful punctuation fill-in. Can your first grader read Joey's passage about summer camp, and then add in the appropriate punctuation marks? 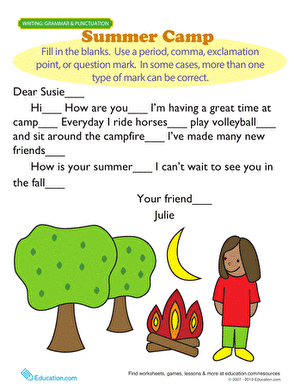 Can your first grader read Susie's letter from summer camp, and then add in the correct punctuation marks? Help the students enjoy their meals by writing the correct punctuation at the end of each sentence. 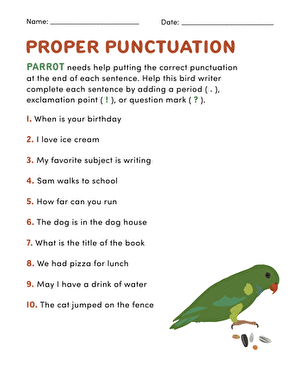 Budding writers can master their basic punctuation with this worksheet. These sentences are missing ending punctuation marks. Encourage your beginning writer to identify and use the different ending punctuation marks with this practise sheet.